Does Donald Trump have the temperament to be Commander-in-Chief? Donald Trump can't even handle the rough-and-tumble of a presidential campaign. He loses his cool at the slightest provocation. When he's gotten a tough question from a reporter. When he's challenged in a debate. When he sees a protestor at a rally. Imagine him in the Oval Office facing a real crisis. A man you can bait with a tweet is not a man we can trust with nuclear weapons. He "loses his cool at the slightest provocation" such as "when he's gotten a tough question from a reporter" and can be "bait(ed) with a tweet." The Khans were not amused and Saturday Ghazala on ABC News responded "Please. I am very upset when I heard when he said that I didn't say anything. I was in pain. If you were in pain you fight or you don't say anything. I'm not a fighter. I can't fight. So the best thing I do was quiet." In an opinion piece the following day in The Washington Post, Mrs. Khan similarly stated "My husband asked me if I wanted to speak, but I told him I could not. " Beats me. If the Khans' marital relationship is as Ghazala maintains, it contradicts the thrust of Islamic teachings.. Yet, the Apostle Paul wrote "A woman[a] should learn in quietness and full submission. I do not permit a woman to teach or to assume authority over a man; she must be quiet" and warned "Wives, submit to your own husbands, as to the Lord." You may have noticed that most Christians do not submit to these Pauline teachings, and so it would be unsurprising if the Khans allow their religious beliefs to be informed by modern realities. Trump's question, therefore, was legitimate, though the answer is far from clear. What is clear, however, is that the real estate mogul was baited into a fight he cannot win. was also deeply, profoundly counterproductive — a man so angry about being cut off in traffic that he crashes his own car in revenge. It's never a good idea to get into a public argument with parents of a veteran who has sacrificed his life for his country. But Trump takes his lessons from his business career: punch down. Instead of focusing on Hillary Clinton or the fellow (whom he now praises) she wants to emulate, Trump- the presidential nominee of a major political party- picks a fight he can only lose. When Rush Limbaugh and Mark Levin challenged Barack Obama to a debate, the President logically did not respond. Although unlikely, the challengers might have "won." If not, they still would have stood toe-to-toe with the President of the United States, the leader of the Free World, who would have been diminished in the eyes of the public. Such a debate would be a lose-lose for any President. Sometimes it's simply time to move on, allow the moment to pass, and focus on your own strengths. Donald Trump won't do that, another reason he won't be elected. Look, we're led by a man that either is not tough, not smart, or he's got something else in mind. And the something else in mind — you know, people can't believe it. People cannot, they cannot believe that President Obama is acting the way he acts and can't even mention the words 'radical Islamic terrorism.' There's something going on. It's inconceivable. There's something going on. I think president Obama has been the most ignorant president in our history. His views of the world as he says don't jibe and the world is a mess, He has been a disaster as a president. He will go down as one of the worst presidents in the history of our country. There’s something about him I do like. I’m embarrassed to admit it. I give him a lot of credit. It’s very unique and very hard to do and I give him tremendous credit. He became a two-term president of the United States. He’s got some quality going. Perhaps (not likely) Donald Trump is mellowing, although it's more likely that he now realizes he's not running against Barack Obama and that with North Carolina now required to allow black people to cast a ballot, the GOP should try more subtle ways to suppress the African-American vote. Currently claiming he likes Barack Obama, he is either lying- or previous comments were completely opportunistic and either flippant, phony, or a concerted effort at dissembling. There is no use trying to figure it out. Instead, the press might want to ask "when are we going to hear what your investigators discovered in Hawaii, Mr. Trump?" Well, we heard Donald Trump's answer last week at his conventionwants to divide us - from the rest of the world, and from each other. Helpfully, that one statement summarized also the premise of her address. 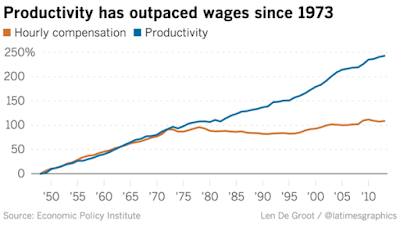 The LA Times' David Lauter, including a graph (below) of hourly compensation vs. productivity from 1973-2010, remarks (annotated speech here) "For the last generation, wages have stagnated for workers without a college education. Both parties are trying to convince those workers that they have a plan for generating more jobs and higher wages." However, Clinton's frame of reference is much more limited. 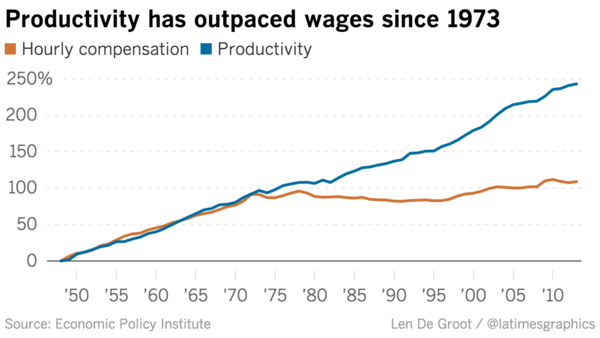 Earlier in the speech, she had commented "Too many people haven't had a pay raise since the crash. There's too much inequality. Too little social mobility. Too much paralysis in Washington. Too many threats at home and abroad. " 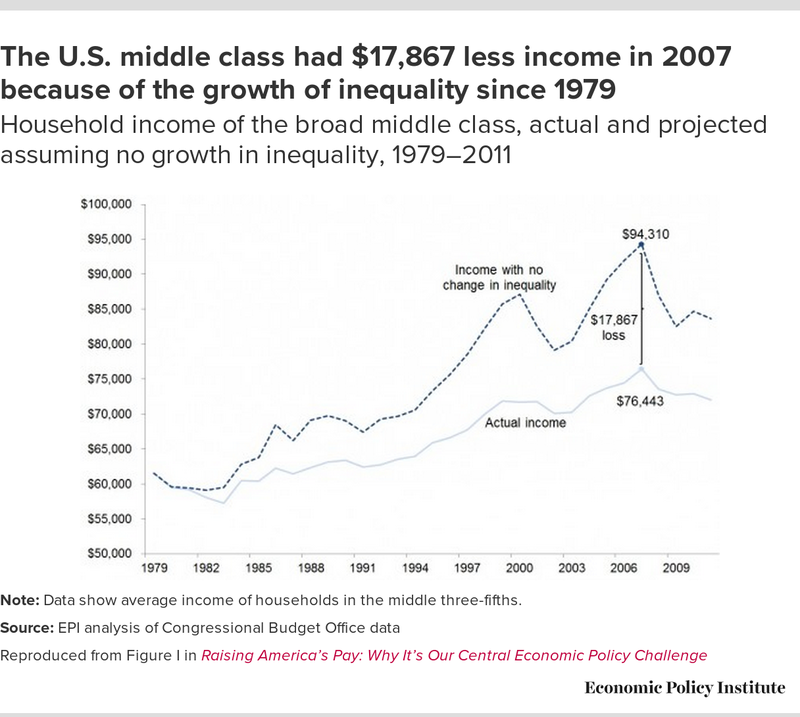 But the problem did not begin with the crash, as Bernie Sanders recognized Monday night when he broke the rules (apparently) by noting "this electionis about ending the 40-year decline of our middle class." Forty years would put us back in 1976. Lauter's baseline is 1973. 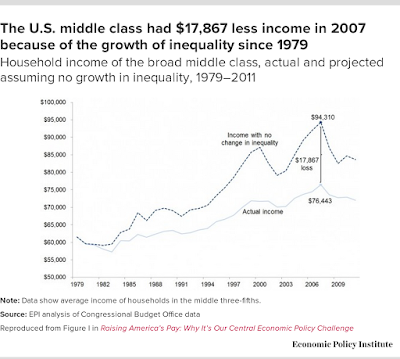 The Economic Policy Institute summarizes "The U.S. middle class had $17,867 less income in 2007 because of the growth of inequality since 1979" with a graph (below) which shows decline beginning in 1981. 1980 included an election which produced a president who set us on the path of inequality or at least jammed his foot on the accelerator. We weren't going to hear about that at this convention, which emphasized outreach to independents and to Republicans, especially those concerned about national security. References to George W. Bush's contribution to economic stagnation were largely avoided and nary a mention of Ronald(6) Wilson(6) Reagan(6) was made. There was little talk of any Republican President, aside from former Reagan Administration official Doug Elmets praising his old boss and Mrs. Clinton charging Donald Trump with having "taken the Republican Party a long way... from 'Morning in America' to 'Midnight in America.'" The subtext, clear though subtle, was that everything was fine until the recent past. As was expected, the speech was effective. Prior to release of its text, conservatives fretted that Clinton would "bash Wall Street" and liberals were concerned that her remarks would befit an individual who appears determined not to release the transcripts of her well-paid speeches to bank executives. Not surprisngly, she steered a middle course and even her refusal to acknowledge that the decline of the middle class has roots reaching back a few decades probably was politically wise. Most middle-aged and elderly Sanders' supporters will vote for her anyway, and most of the young ones probably are more concerned over the travesty of rapidly-escalating college debt (which she addressed) and our nation's military posture (which she appears to be satisfied with). The case has been made that Donald Trump is dangerous and will take us back and that Hillary Clinton is not and will not. Recognition of the nation's structural economic dysfunction awaits another campaign and probably another presidency. Treason doth never prosper: what's the reason. If it is Russia, which it's probably not, nobody knows who it is, but if it is Russia, it's really bad for a different reason, because it shows how little respect they have for our country. When they would hack into a major party and get everything, but it would be interesting. I will tell you this. Russia, if you're listening, I hope you find the thirty thousand emails that are missing. I think you'll probably be rewarded mightily by our press. Let's see if that happens next. Trump senior communications advisor Jason Miller first tweeted "To be clear, Mr. Trump did not call on, or invite Russsia or anyone else to hack Hillary Clinton's e-mails today." There is only one thing accurate about the tweet. Trump did not suggest the e-mail system be hacked today; it could be done at any time. Miller soon followed that with "Trump was clearly saying that if Russia or others have Clinton's 33,0000 illegally deleted emails, they should share them w/FBI immed." Your first clue that Miller is pulling his remarks out of Trump's wrong orifice is that twice he claimed his client was "clearly saying." One time suggests the client was not "clearly" stating anything; twice makes it obvious the client was not even trying to say what he reportedly is "clearly" saying. The second clue might be that Trump never even mentioned the FBI, unless he mistakenly said "Russia" when he meant "FBI." He gets confused like that sometimes. A few hours after Miller's rationalization, Trump claimed "Of course I'm being sarcastic. And they don't even know frankly if it's Russia." It's becoming increasingly clear the e-mails were hacked by Russia. Trump does not understand the word "sarcastic." And was he being sarcastic when he (supposedly) maintained Russia should give them to the FBI? Trump's campaign and the candidate himself should get their stories straight. Still, virtually no votes will be lost by the candidate who once boasted "I could stand in the middle of 5th Avenue and shoot somebody and I wouldn't lose voters." "But," as Charlie Pierce writes of Trump's unprecedented remarks, "it's nice to keep a record, because future historians are not going to believe this happened." 1. Trump's debt load has grown dramatically over the last year, from $350 million to $630 million. At the same time, he’s been blackballed by all major US banks. 2. Post-bankruptcy, Trump has become highly reliant on money from Russia -- most of which has over the years become increasingly concentrated among oligarchs close to Vladimir Putin. 3. Paul Manafort, Trump's campaign manager and top advisor, spent most of the last decade as top campaign and communications advisor to Viktor Yanukovych, the pro-Russian Ukrainian Prime Minister and then President whose ouster in 2014 led to the on-going crisis and proxy war in Ukraine. Yanukovych was and remains a close ally of Putin. 4. Trump's foreign policy advisor on Russia and Europe is Carter Page, a man whose entire professional career has revolved around investments in Russia and who has deep and continuing financial and employment ties to Gazprom, which, in turn, is part of Putin’s financial empire. 5. Over the course of the last year, Putin has aligned all Russian state controlled media behind Trump. 7. Trump is also suggesting the US and thus NATO might not come to the defense of NATO member states in the Baltics in the case of a Russian invasion -- another important issue to Putin. Nonetheless, Trump may not be lying. Although Democrats have stated that the GOP nominee is favored by Putin, no one has argued that Trump has been dealing with the Russian oligarch. The primary charge is that the relationship between the two demagogues is close enough that Putin has awfully good reason to have his lieutenants hack into Democratic National Committee e-mail messages and encourage their release now. Trump may have zero "investments in Russia" and still, as Reich's list suggests, have with that nation intricate business relationships which would be jeopardized if Putin's expansionist tendencies are held in check. Additionally, Trump never contended he has no investments in Russia. He tweeted "For the record, I have zero investments in Russia." He's telling us that it is for the record that he is making the claim. He also tells Russia "I hope you find the thirty thousand emails that are missing," because there is no better proof of being patriotic than to wish a foreign adversary knows what the Sate Department is up to. Fifty years ago, the irony was "Richard Kimble is innocent." The irony now is far more threatening. After Democrats lost many national and state elections because of the coziness the GOP alleged between the Democratic Party and the Soviet Union (even then, usually popularly referred to as "Russia"), the Democrat could now will lose the presidential election because of the (real) coziness between the Republican and the KGB strongman running the show there. We know it as "Beware of Greeks bearing gifts." The full quote (though disputed), however, is "Do not trust the horse, Trojans. Whatever it is, I fear the Greeks even when they bring gifts." To this may be added. Do not trust "reform," voters. Whatever it is, I fear the Republicans even when they bring gifts." The Democratic platform, approved yesterday in Philadelphia, contains an extensive section on criminal justice, as does that of the GOP. Whatever the wisdom of specific recommendations, the intentions are progressive and well-meaning. Thus, the Democratic plan includes support for "community based law enforcement programs" and a requirement for the Department of Justice to "investigate questionable or suspicious police-involved shootings." It supports "banning the box" and "restoring voting rights." The Party promises "we will abolish the death penalty" and its commitment to equal justice is summarized in its call to "ending mass incarceration" and "the discriminatory treatment of African-Americans, Latinos, Asian Americans and Pacific Islanders." And at perhaps its wisest, the framers promise to "close private prisons" and to "assist states in providing a system of public defense that is adequately resourced and which meets American Bar Association standards." For all the talk last year about Democrats like New Jersey Senator Cory Booker and Republicans such as Utah Senator and (the dangerous) Grover Norquist finding common ground in criminal justice reform, you'd never know it by glancing at the GOP plank on criminal justice. we urge caution in the creation of new “crimes” and a bipartisan presidential commission to purge the Code and the body of regulations of old “crimes.” We call for mens rea elements in the definition of any new crimes to protect Americans who, in violating a law, act unknowingly or without criminal intent. We urge Congress to codify the Common Law’s Rule of Lenity, which requires courts to interpret unclear statutes in favor of a defendant. Such regulatory infractions are enforced and penalized through the same traditional process that is used to investigate, prosecute, and penalize rapists and murderers, even though many of the people who commit such infractions are unaware that they are exposing themselves to potential criminal liability by engaging in such activities. The Heritage Foundation, a favorite of Rush Limbaugh and many other doctrinaire conservatives, is not concerned with the average citizen charged with a criminal offense. And it so happens that the GOP platform plank on mens rea dovetails neatly with the Party's congressional moves toward criminal justice "reform." corporate criminals. The major proponents of mens rea reform include companies, most prominently Koch Industries, and activist groups who believe that the federal government holds too much power to criminally charge companies and their executives without having to prove criminal intent. Judiciary Chairman Sen. Charles E. Grassley (R-Iowa), meanwhile, argued the concerns raised by proponents of mens rea reform “just don’t hold up” and that they are “holding unrelated bills hostage.” Sen. Sheldon Whitehouse (D-R.I.) went further and suggested that the proposed changes amounted to a “Trojan horse” inserted into the criminal justice reform debate by political groups who have no broader interest in the issue. The fate of mens rea legislation in Congress is uncertain. However, as support from the Heritage Foundation and the Koch Brother indicates, any effort to make it more difficult to prove intent is a Trojan Horse designed to coddle the masters of the corporate universe. If we start engaging in the kinds of proposals that we've heard from Mr. Trump or some of his surrogates like Mr. [Newt] Gingrich, where we start suggesting that we would apply religious tests to who could come in here, that we are screening Muslim Americans differently than we would others, then we are betraying that very thing that makes America exceptional. celebrates the attacks in Belgium and features Donald Trump. As images of flames dance over the Republican presidential front-runner's face and footage rolls of emergency workers in Brussels, audio from a recent Trump interview with Fox News plays. "Brussels was one of the great cities. One of the most beautiful cities of the world 20 years ago," Trump says. "It was amazing actually. And safe. And now it's a horror show. It's an absolute horror show." The nine-minute video, allegedly released by the Al-Battar Media Foundation, a pro-ISIS media group, flashes phrases such as "Brothers, rise up!" and "Let's go, let's go, let's go for jihad" as Trump and pundits are heard describing the Brussels attacks. The video also includes shots of fighters brandishing AK-47s and other weapons and extols the virtues of those who are willing to attack the terrorist group's enemies. A narrator intones, "The Crusade jets—including the Belgian—are still bombing the Muslims in Iraq and Levant day and night, killing children, women, old, and destroying mosques and schools." The user who uploaded the video to YouTube was banned within minutes of posting, according to Politico, because of the site's policy of taking down pro-ISIS recruitment videos. When Trump was asked about the earlier video, he responded, reasonably, "Look, there's a problem. I bring it up... They use other people. What am I going to do? I have to say what I have to say." A man has to do what a man has to do. For Donald Trump, it's encouraging Vladimir Putin and those radical Islamist terrorists he blames on Hillary Clinton and whose attacks he skillfully uses to gin up terror in the public. In the unlikely event Trump's recent surge in popularity is maintained and he ends up in the White House, he'll have at least two powerful allies to thank. It might may (sic) no difference, but for KY and WVA can we get someone to ask his belief. Does he believe in a God. He had skated on saying he has a Jewish heritage. I think I read he is an atheist. This could make several points difference with my peeps. My Southern Baptist peeps would draw a big difference between a Jew and an atheist. OK, most political consultants think like this because many of them are reptiles. But the really smart reptiles do not write stuff like this down. They whisper it among themselves and then, glory be to the god of coincidence, the embarrassing question gets asked a few months down the line when it will damage the target the most. Obviously, the most serious question the e-mail poses is what the Democratic National Committee was doing lobbying for one of the candidates running for its party's presidential nomination. Close behind would be the understanding of the role of a Chief Financial Officer in setting campaign strategy. Yet, another question arises: in what universe is "peeps" still a thing? Now rarely used, when in vogue, it was employed primarily by people under 25 and older people pretending they were otherwise. And it was not popular among Southern Baptists in Kentucky and West Virginia. Brad Marshall should be fired if for no other reason than using "peeps" in an e-mail in 2016. Trump incompetence ought to be a bigger issue in this race, but at least 40% of voters are so dazzled by Trump's wealth and gilt and buildings and golf courses and wives that they just can't conceive of Trump as a bumbler. That's something the Clinton campaign has to work on. But it's an uphill fight. It is uphill because Americans outside of major media markets and the northeast think Trump, who brags incessantly about his (alleged) exorbitant wealth, is almost uniquely wealthy and successful. They don't realize that in the milieu (profession, New York City region, circle of acquaintances) in which Trump operates, there are a lot of individuals far more successful than he. Trump boasts, “I have made myself very rich.” Credible objective sources estimate his net worth at between $2.9 and $4.1 billion. While wealth is a poor measure of deal-making skill (Bernie Madoff was richer than Trump), there is special reason to doubt that Trump’s wealth can be traced to negotiation ability. It’s been estimated that if Trump had simply invested his current net worth from 1982 (built atop the fortune he received from his father) in an S&P 500 index fund and made no deals, he would have $8 billion now. In other words, Trump’s deal-making over the last quarter century has actually cost him billions of dollars. But Trump continually claims he's a great deal maker. In The Art of the Deal, he maintained "That’s why a little hyperbole never hurts. People want to believe that something is the biggest and the greatest and the most spectacular. I call it truthful hyperbole." It’s easy to identify examples that belie Trump’s claim that he is an excellent deal-maker. The airline he bought in 1988 for roughly $365 million closed down in 1992. The football team he bought in 1984 ended with the demise of United States Football League just two years later. His hotels and casinos have struggled to make money, declaring bankruptcy four times. Ironically, even Trump’s version of how skillfully he renegotiated loan terms with his bankers after going bankrupt has been debunked by those who were at the table. Consider what was supposed to have been his most important deal: developing Manhattan’s West Side Yards, then the largest undeveloped property in New York City. The negotiations with public, private, and regulatory stakeholders devolved into a vulgar exchange of insults between Trump and then-New York Mayor Ed Koch. Trump was ultimately forced to sell to a group of Chinese financiers in a deal The New York Times described as “perhaps the closest that Mr. Trump has come to international diplomacy.” But the negotiation left Trump so angry at his Chinese partners that he later sued for $1 billion. The court ruled against him. we have seen obvious negotiation failures. By one estimate, the Trump campaign paid three times what the Sanders campaign did to run commercials during the same time slots on the same stations. Meanwhile, he has undermined numerous other deals. Both NBC and Univision declined to air Trump’s Miss USA pageant last year after he disparaged Mexican immigrants. Companies in the Arab world have severed ties with Trump after his comments about Muslims. At home, there’s a long list of U.S. companies that have severed or loosened ties with the Republican National Convention. The inability to negotiate effectively and make a good deal was on full display during the convention. The Trumpists were under no obligation to permit Ted Cruz to address the convention whether or not he already had endorsed Trump. They should have at the minimum secured a promise from the Texas senator that his speech would include an endorsement. In the long term, this will make little or no difference and in the short term has made no difference. However, if a President Trump continues to believe he's the best negotiator ever and bargains away European security or the full faith and credit of the United States, there could be catastrophic consequences. Dismantling "the "painstakingly cultivated image of Trump as a great negotiator" which Malhotra and Moore recognize may not be necessary to defeat the GOP nominee. But if this is how a President Trump perceives himself, he prove even more disastrous than imagined. We can "fact-check" Donald Trump's acceptance speech all we want, and it's a critical task, fortunately accomplished by the likes of NBC News, New York Times, USA Today, NPR, Washington Post, Politifact, Politics USA, Voice of America, Chicago Tribune, and Time. But that really wasn't what Thursday night's acceptance speech was about, nor what the convention was about. It little to do with conservativsm, moderation, or centrism, or any specific policy proposal. It wasn't primarily conservative or moderate or concerned with any specific policy proposal. There was not even much populism, although the candidate did condemn the NAFTA in two separate paragraphs without explaining what is wrong with the pact, how it could be improved, or even what the letters in "NAFTA" represent. I have a message for all of you: The crime and violence that today afflicts our nation will soon — and I mean very soon come to an end. Beginning on January 20th 2017, safety will be restored.... When I take the oath of office next year, I will restore law and order to our country. "There can be no prosperity without law and order" remarked the ghost of Richard Nixon Thursday night, and "I am the law and order candidate." He will not merely improve the economy because "On the economy, I will outline reforms to add millions of new jobs and trillions in new wealth that can be used to rebuild America." Additionally, "I have proposed the largest tax reduction of any candidate who has run for president this year, Democrat or Republican." ISIS won't be merely turned back or even defeated. Rather, "we are going to defeat the barbarians of ISIS. And we are going to defeat them bad." Moreover, "peace will be restored by enforcing the rules for the millions who overstay their visas, our laws will finally receive the respect they deserve." His public works program will not add tens of thousands or hundreds of thousands of jobs but "in turn, will create millions of more jobs." National defense will not be merely strengthened but instead "we will completely rebuild our depleted military." Care of veterans will not be merely improved but "we will take care of our great veterans like they have never been taken care of before." And that's not even including The Wall, his great, big, beautiful wall, which will never be built once his conservative advisors remind him that lots of immigrants will work hard for very little money without being given a path to citizenship. Ultimately, the task of the Democratic campaign will be to remind voters that this is not the country pictured by Donald Grump, a country overrun by lazy Mexicans and Muslim terrorists, in which police must cower in fear of criminals in the District of Columbia, Baltimore, and Chicago. It is not a country, Democrats must emphasize, in which people are taxed more than anywhere else in the world, half the country goes to bed hungry, and few people are working because of a third-world public education system. And it is not a nation in which the military is decimated, as it was in Germany after World War I, nor in which the national debt is spiraling out of control as it did there between the two world wars. This is not Germany, and it is not circa 1930. Most of all, we must not resent multiple nations and anyone not sufficiently American nor consider every failure a "humiliation." Otherwise, we go down a long, deep, and dark tunnel which does not lead to anything good. We deserve leaders who stand for principle who unite us all behind shared values, who cast aside anger for love. That is the standard we should expect from everybody.... If you love our country and love your children as much as I know you do, stand and speak and vote your conscience. Vote for candidates up and down the ticket who you trust to defend our freedom and to be faithful to the Constitution. Of course, Christie then was applying to be the Republican presidential nominee in 2016. This week, he was applying to be President Trump's Attorney General and the prosecutor, judge, and hanging jury of Hillary Clinton. Yet, it is Ted Cruz who is "selfish." During the campaign, Donald Trump threatened to "spill the beans" on the Senator's wife as he posted an extraorinarily unflattering photo of her, after which Ted labeled Trump "a sniveling coward." Later, the eventual nominee would suggest Cruz's father had a hand in the (John) Kennedy assassination; when he left the race, Cruz recognized Trump as "utterly immoral," as well as a "serial philander" and "pathological liar,"
Tonight we will discover whether Ted Cruz, under mounting pressure from individuals who believe ideology and family must give way to the need to nominate a man the leader of his party publicly called out for racism, will support Donald Trump for President. We will learn whether Ted Cruz endorses an utterly amoral, sniveling coward. Cruz left the stage with no little dignity. (According to CNN's Dana Bash, he got confronted several times in the hallway by outraged Trump supporters.) He is one of the few people who have spoken here who can honestly say that. And I most emphatically include the candidate himself. New Jersey Gov. Chris Christie, rumored as a possible attorney general pick for Donald Trump, said he would “bring the case” against Hillary Clinton if he was in charge of prosecuting her. In perhaps one of the most well-received speeches of the Republican National Convention so far, Christie prosecuted a broad case against Clinton’s candidacy, inspiring chants of “lock her up” from the convention floor. Wednesday morning, Christie said he thought Clinton should have faced criminal charges, not just political ones, over allegations that she improperly used a personal email server during her tenure as secretary of state. “She should be convicted, absolutely,” Christie said. “I think Jim Comey is a smart, good guy, but here's the problem: He forgot his job. In perhaps one of the most well-received speeches? No "perhaps," and no "one of the most." The New Jersey governor's speech was better than Mrs. Trump's had been even if if were not revealed a portion was plagiarized. 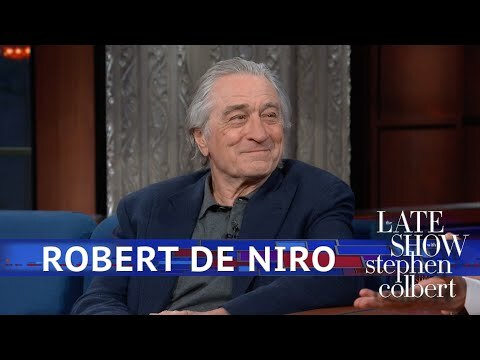 It was superior to that of Rudy Giuliani, who screamed to a rabid and enthused convention audience while seemingly unconcerned about how it would come across to viewers. But Christie, a former prosecutor himself, said the decision of whether or not to bring the case should not have been left to Comey. The New Jersey governor said the call should ordinarily have been Attorney General Loretta Lynch’s, but in this particular case, Lynch’s actions left her unable to involve herself. The message of the former U.S. Attorney to the nominee is clear: make me your Attorney General and FBI or no FBI, I'll indict "Crooked Hillary." It is an extremely effective message from Christie to the guy who would appoint him, after which a GOP-dominated Senate (as it surely would be if their candidate is elected) would approve his nomination, save a particularly scathing report from the U.S. Attorney in the Bridgegate case. But it is, paradoxically, a speech which will make it more likely that the subject of Christie's attack will be elected. Be honest now: think of all the times you've heard a fan, more likely a broadcaster or talk-show host, speak of the pressure on a professional sports team to win a game or a series while the other team can play "loose." It happened when the great, or once-great, Peyton Manning, arguably the best regular season quarterback in NFL history but plagued by having only one Super Bowl ring, played the young and improving Carolina Panthers. It was repeated when LeBron James, one of the half dozen greatest (among non-centers) players in NBA history, was widely criticized for not having won nearly as many championships as the legendary Michael Jordan. Down 3-1, James' Cleveland Cavaliers came back to win the series 4-3. It's need. The team which needs to win usually does. The other guys, like the Panthers, can wait or as with to the Golden State Warriors, had already won one. Need will play a crucial role in the presidential race. Hillary Clinton has been eyeing the presidency for many years and is eager to become the first female President ever, making history eight years after Barack Obama made history. Donald Trump doesn't need the presidency and already has far exceeded expectations. Oh, he would capitalize mightily on being Chief Executive of the federal government but he long has demonstrated a knack for turning ego, greed and corruption into a huge business empire without running for office. And now, if she ever had any doubt, Hillary Clinton knows that if she does not win this election, the likely Attorney General plans to put her in the "stripes" that speakers and attendees at the Republican Convention are longing to see. Now that "Trump Nominated," a headline I though (until April 27) I'd never live to see, has come about, attention can turn to Ted Cruz. Asked in Wisconsin whether he'd support Donald Trump if he won the GOP nomination, the Texas senator on March 25 stated “I don’t make a habit out of supporting people who attack my wife and attack my family." He added, however, “Donald Trump is not going to be the Republican nominee.” That didn't come out as he expected. Perhaps neither will his pledge not to endorse Grump. It was not a one-off for Grump to threaten to "spill the beans" on a family member. Marlene Ricketts, wife of GOP activist and donor Joe Ricketts and father of Nebraska governor Pete Ricketts, had contributed $3 million to anti-Trump super PAC Our Principles PAC early this year. Grump tweeted "I hear the Rickets family, who own the Chicago Cubs, are secretly spending $'s against me. They better be careful, they have a lot to hide" (grammatical and spelling errors in original). Give Rudy Giuliani credit. In contrast to other speakers at the first night of the Republican National Convention, he did not say Hillary Clinton belonged in prison or in stripes, nor did he shout "Hillary for Prison." The former New York mayor spent his moments "huffing and puffing with such fire and brimstone," Fred Kaplan observes, "spewing such rank nonsense." Giuliani demanded "unconditional victory against them," which apparently referred to "radical Islamic terrorism," notwithstanding terrorism being a movement or ideology rather than a group of people. "We know who you are and we're coming to get you," boasted Rudy, speaking from the comfort of a podium in Cleveland, Ohio, USA. Vagueness was a shrewd, if obvious, maneuver, given that there are at least six active terrorist organizations in the Middle East/North Africa and admitting complexity would lay bare the absence of any actual Republican plan (other than USA! USA!). The sanctions enacted by the United States and Europe in 2011 and 2012 included the freezing of Iranian assets in many international banks. Nobody knows the total amount of frozen assets, but it’s probably about $100 billion. Estimates go as high as $150 billion, the number some critics of the nuclear deal use to make the “windfall” coming to Iran seem larger than it probably is. The deal would release those assets, allowing Iran full access to them. But the money belongs to Iran in the first place; it’s not coming from some other country. Iran owes some major debts to countries such as China, and it would use perhaps $50 billion to pay those, according to an analysis by the Brookings Institution. The big question is what it will do with the rest of the money. If Iran pumped $50 billion into terrorist networks such as Hezbollah, or shared it with unsavory dictators such as Syria’s Bashar al-Assad, it would undoubtedly be destabilizing and lead to the kind of bloodshed Cruz warns about. But many analysts think Iran won’t use the money to fund terrorism and will instead pump it into the Iranian economy, which needs some help. It's time to make America safe again. It's time to make America one again. One America! What happened to there's no black America, there's no white America America, there is just America? What happened to it? Where did it go? How was it thrown away? So -- so if you want to deal -- if you want to deal with this on the black side, you've got to teach your children to be respectful to the police and you've got to teach your children that the real danger to them is not the police, the real danger to them 99 out of 100 times, 9,900 out of 1,000 times are other black kids who are going to kill them. That's the way they're going to die. He did not lecture parents. He lectured black parents, evidently in the spirit of "just America." Neither Giuliani's assertion on the Sunday talk show or at the GOP convention is a matter of objective fact or falsehood and so will not be reviewed by Politifact, FactCheck.org, the Washington Post's Fact Checker. It goes less to the character of the man than to the Party he represents that one of the speakers who did not advocate hauling Hillary Clinton off to jail still contributed to the hysteria of opening night. Hillary Clinton released a new ad Monday morning, trying to capitalize on some Republicans' fears of a Trump presidency. The ad, called "Confessions of a Republican," replicates an ad from the 1964 election with the same name in which a life-long Republican says he will vote for the Democratic nominee. In 1964, it was for Lyndon B. Johnson, and now the same actor, Bill Bogert, says in Monday's ad he will vote for Clinton in November. There is one good thing about the ad- avoiding the nearly irresistible urge to point out that Donald J. Trump is a complete fraud. Instead, the individual says "A friend of mine told me 'just because a man sounds irresponsible during the campaign doesn't mean he's going to act that way.' Well, I don't buy that." The GOP candidate means very little of what he says but polls indicate the public believes Trump is less insincere than is Clinton, presumably because he makes his statements loudly and vehemently and never acknowledges a mistake or apologizes. Therefore, painting Trump as radical and dangerous is an easier sell. But Mr. Bogert evidently is not your friend, relative, neighbor, or some stereotypical "common man" from southern Ohio, southwestern Virginia, or the Arizona suburbs. He is an actor. There are approximately 146 million registered voters in the USA and approximately 126 million citizens voted in the 2012 general election. Gallup has found approximately 26% of registered voters currently are Republican. It can be speculated, therefore, that there are approximately 37 million Republicans and 30-35 million will go to the polls this November. Out of the 30 million-plus Republicans who will vote, the Clinton campaign evidently found exactly zero who will opt for her in November. Practically off the top of my head, I can give you Brent Scowcroft. (I cheated.) Instead, the Clinton ad people put on an actor and, to make it more obvious, one recycled from 52 years ago. When Donald Trump gets hold of this, he'll have one reaction: "Sad." For conservative pundit Erick Erickson, Indiana Gov. Mike Pence would be "the perfect vice presidential pick for Donald Trump." But it's not because Erickson, who is solidly in the Never Trump camp, has a high opinion of Pence. "Mike Pence would actually be the perfect vice presidential pick for Donald Trump because he lacks the courage of his convictions and would absolutely not overshadow Donald Trump," Erickson wrote in the post on Monday on The Resurgent, in which he tore apart the Republican governor's record since taking office in 2013. "He gives Trump the veneer of conservatism without anyone ever having to worry that he’d actually fight for those principles." CNN finds Pence "backed every free trade deal up for a vote in his 12 years in Congress. Pence voted for the Central American Free Trade Agreement, as well as trade pacts with South Korea, Colombia, Panama, Peru, Singapore and more." He supported fast track authority for the President and once claimed under the NAFTA "the volume of US corn exports to Mexico has nearly tripled since 1994." On September 8, 2014 he tweeted "Trade means jobs but trade also means security. The time has come for all of us to urge the swift adoption of the Trans Pacific Partnership." Interviewed Sunday with Trump by Leslie Stahl on 60 Minutes, however, the Governor neither acknowledged his differences with Trump nor admitted that he is conforming his views with the head of the ticket. Instead, he pretended "I support free trade, and so does Donald Trump," who has condemned the NAFTA, the TPP, and advocated a 45% tariff on goods imported from mainland China and 35% on items imported from Mexico. Stahl asked, for example, if Pence agreed that Arizona Sen. John McCain was not a war hero because he was captured, as Trump argued. “I have a great deal of respect for John McCain,” Pence began. When politicians want to avoid admitting they don't like or agree with another politician, he is "a good friend of mine" or someone "I respect." Consequently, in March, 2012 on Fox News, Trump remarked that Joe Biden "has been a good vice president for the agenda that they set and he has been a very, very loyal person. I respect him for that." When Hanoi learned the identity of McCain's father they crowed, "We have the crown prince!" and he was asked, "Do you want to be released?" A few years of torture ensued and McCain finally was released. Decades later, he would decide that Sarah Palin was qualified to be vice-president. Sometimes age does not bring wisdom. Pence will not say he disagreed with Trump, only that he "respects" him, which could be for any reason, including that the guy his running-mate considers a loser has managed to get elected to the U.S. Senate five times, no mean feat. Or perhaps it means he has a fine family or has steadfastly maintained his hawkish principles. He did not, however, say he believes John McCain was a war hero. Ever a culture warrior, Erick Erickson criticizes Pence for watering down the state's Religious Freedom Restoration Act the governor had signed when he faced a possible exodus of business from Indiana.. "He folded like a cheap suit," Erickson noticed of the trait evidently most admired by Donald Trump in a running mate. Mike Pence does not intend to disappoint.